My children are huge fans of the Disney Junior channel and one of their favourite shows on it is without a doubt Vampirina. The show launched late last year and follows the tale of Vee the Vampire and her family the Hauntleys as they move from Transylvania to Pennsylvania and open up a spooky B&B. The show celebrates friendship and difference and sends a great message to young viewers about the importance of these. 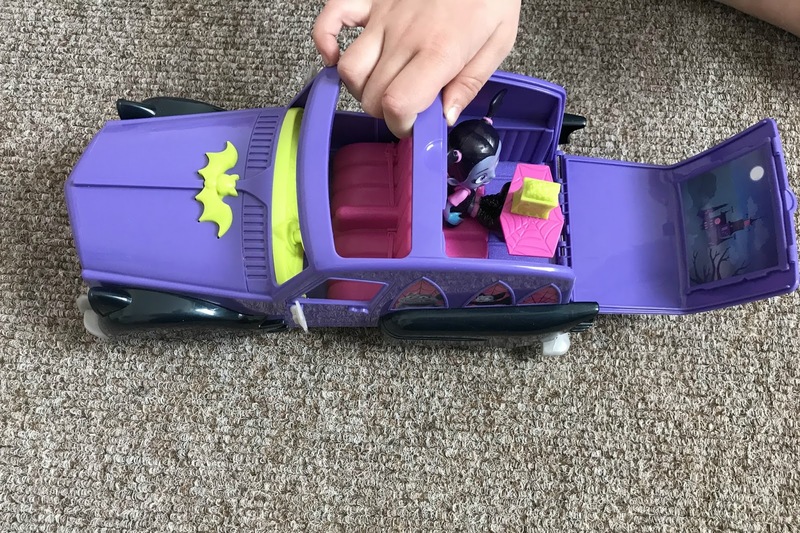 As the show has been such a hit with young viewers Flair toys have recently released a range of Vampirina toys that will appeal to both boys and girls. The range includes dolls, figures, playsets, instruments and accessories. We were recently sent a box full of the new toys to try them out and see what we thought. 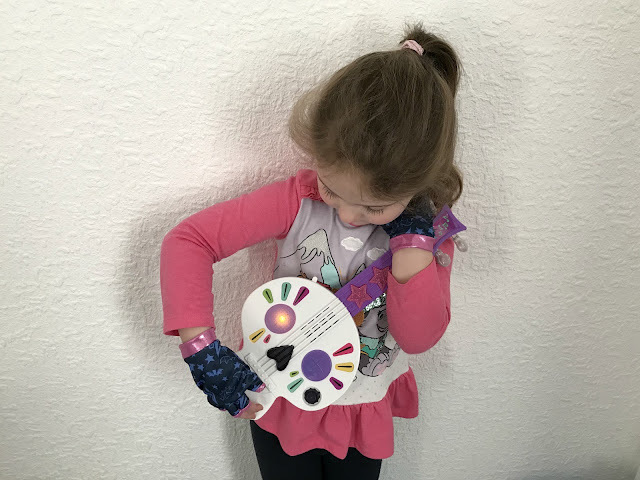 This Spookylele (love that name) looks just like the one Vampirina has in the show and it even comes with some rather spooky looking gloves too. 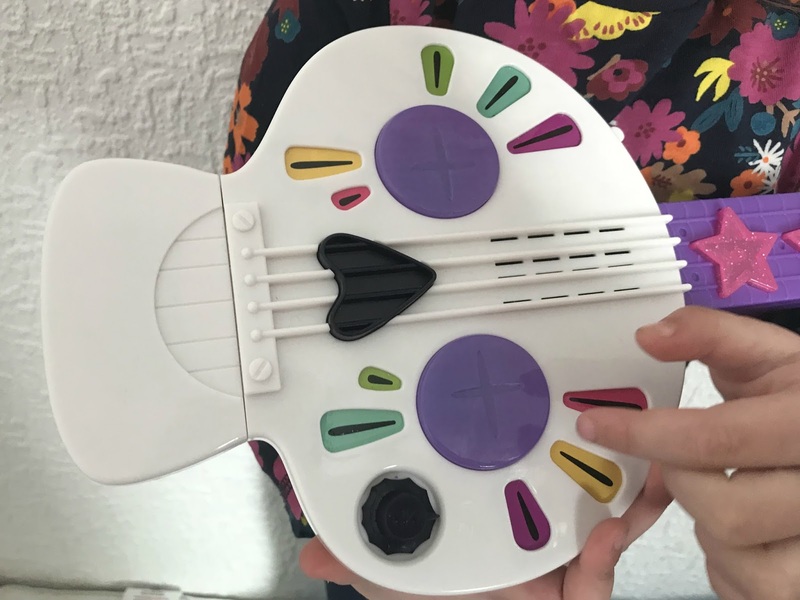 The Spookylele is a rather funky skull shape and if you press the buttons it plays the Vampirina theme tune, guitar riffs and whammy sounds as well as lighting up. Children will have great fun playing with it and us parents will be pleased to know it has an on/off switch. The only thing was the gloves are rather snug fitting and my 3-year-old couldn't fit them on his hands. This Vampirina doll is rather impressive standing at 30cm tall and she can stand on her own. 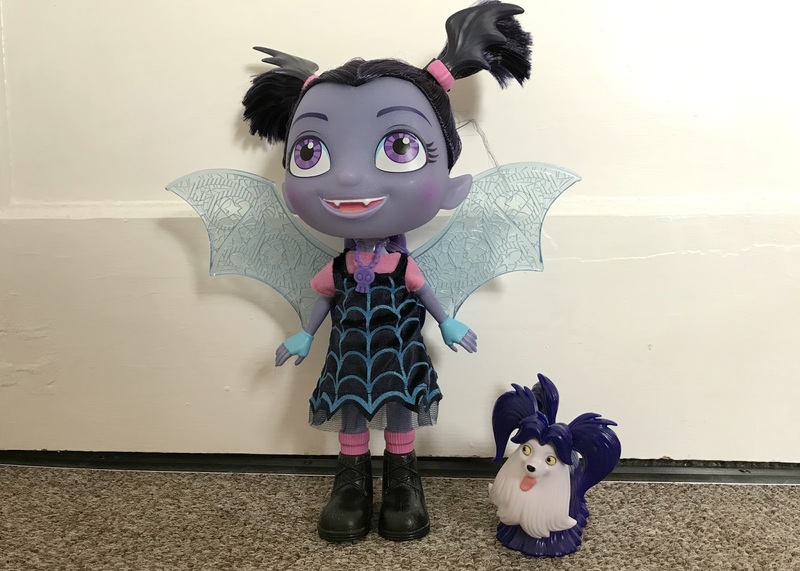 She looks so like the Vampirina children know and love from the show, she is wearing her signature spook-tastic web-detailed dress, has her bat pigtails in her hair and she even has pop-up and light-up wings. If you press her necklace she will say fun phrases from the show and you can even put her into flying mode to hear fun sounds. She comes with her trusted pal Wolfie the dog, who doesn't do anything but he does make a good accessory for children to play with the doll with. The Hanutleys car comes with a small Vee figure to play with, you can push this car around and press the button on the bonnet for lights, sounds and music. Not only is it a car though as you can turn it into a moonlit movie theatre by opening the boot and discovering the hidden movie screen, table and box of popcorn inside. My little boy loves playing with this and it is great for imaginative play. 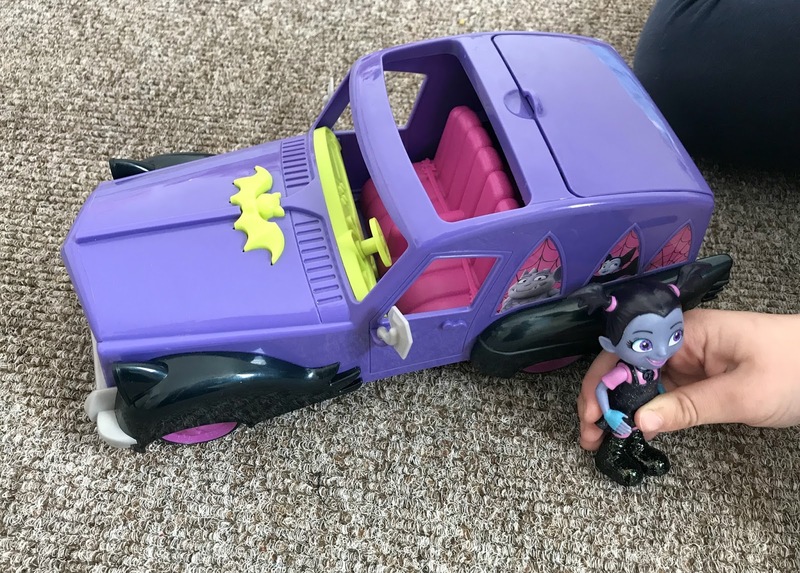 I think that any Vampirina fan will enjoy these toys, my children certainly do. Flair also have Best Ghoul Girl figures (£9.99) a Fangtastic friend set of 10 characters of Vampirina, Oxana, Boris, Demi, Bridget, Nosy, Gregoria, Wolfie, Vampirina's case of the Battys and a backpack accessory (£29.99 for the set) and they have Rock 'n Ghoul Microphones (£6.99). All of these toys are available to buy now from all good toy stores. 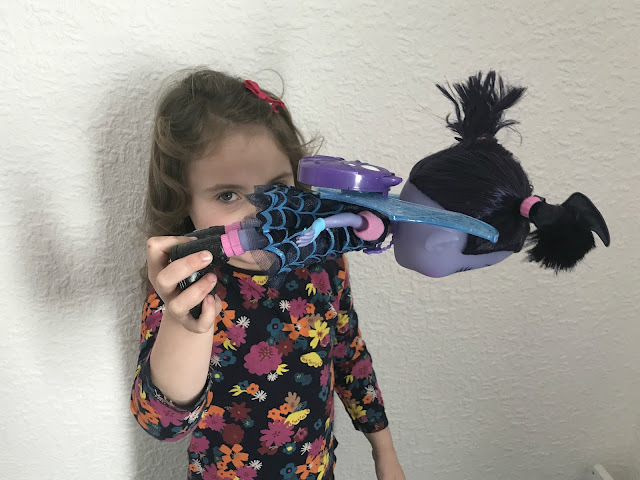 If your child is a fan of the Vampirina show then make sure you join us and lots of other lovely bloggers in a Vampirina Twitter party with @UKMumsTV. The Twitter party will take place on Wednesday 28th February between 1 - 3pm you can join in by following @UKMumsTV and using the hashtag #VampirinaToys where you can find out more about the toys and there will be prizes to be won. Full details can be found at www.ukmums.tv. Have your children discovered Vampirina yet? Disclosure I received these toys for the purpose of this review and have been compensated for my time, however, all opinions are my own. Toys that encourage creativity are brilliant. We have so many musical and art based toys in our house. I think it is so important to encourage the boys to express themselves through creativity. This is actually my first time hearing of the Vampirina franchise but I love the look of that spooklye what a fabulous instrument.